And anyone else who might be thinking of rating this lowly so early, it's Trigger. Let them work their magic at their pace. They will always deliver, and their favorite pastime seems to be taking done-to-death genres, cranking them to 11, and then curbstomping them into oblivion near the end. If they're doing that with Harem this time around, which very well may be the case, let the mojo flow. They'll develop the crap out of those characters and have a tear shed at some point or another. It's what they do, what they've always done! I feel slightly manipulated by this series. Going in, I was expecting a highly satirical show with lots of fun, over-the-top battles. And while what little we've seen of potential battle sequences are pretty awesome, and there is a good bit of satire and even some deconstruction, this show really isn't what I was hoping for or expecting yet. And despite that, I still enjoyed most of it. I ordinarily would never watch a high school harem romantic comedy, but this show tricked me into giving it a chance with a great pilot and some hints at a deeper, darker story to come. Turns out, it's quite polished, with an enjoyable art style, good character chemistry, and unexpectedly pointed writing; all in all, a very charming series when at its high points. Andou is a great MC with hidden depths and definitely isn't a generic kind-hearted-high-school-boy that a lot of shows within the genre use. The series wouldn't be worth much without him. Most other characters got good development but seemed like standard tropes done really well more than anything else. Overall, not what I was expecting, and had I known how different the show would be from what I was hoping for, I likely wouldn't have started; but I did start and am glad of it, and it's certainly not a bad show. It hits some great highs but ultimately doesn't go far enough with its more interesting themes. There's some great deconstructions of otaku-dom and of harems, but those elements don't get enough of a focus, and the ending's more of an "end-of-the-beginning" than anything else. It's still one of the best of its genre and I'd watch a sequel if one were made. Well. I didn't expect this from Trigger. Let me preface this by saying that I wasn't a fan of Studio Trigger. Before this show, they didn't really have me all that impressed. This , however, was not something I expected from them. The animation is smooth and consistent, even fluid in scenes that are usually more static or rigid in Anime with Comedy elements. It's also pretty gorgeous, in my opinion, and so far hasn't really bothered me, aside from maybe 1 or 2 moments. The characters themselves, albeit a bit cliche at times, are all pretty solid. Jurai Andou, the main-main character, is silly and ridiculous a lot of the time - but is serious when he needs to be, giving loving (yet honest) advice to his close friends in the Literature Club. It's a nice thing to see and makes him noteworthy as a character when compared to other shows similar to this. The rest, although also nice, would take up too much time for me to get through currently. The other 4 main characters though, have decent development, each getting their own episode so far, and all feel pretty dynamic, rather than generic. I actually grew to like all of them rather fast. The music fits the scenes really well, and seems like it'd be enjoyable on its own. The emotional scenes have some heart-clutching tracks playing in the background, and the comedy scenes have fitting music playing as well. Sometimes the music seems a bit overpowered but that's rarely, and not enough to be a nuisance. The Opening and Ending songs, by the way, while not super fantastic, are incredibly catchy and enjoyable, in my opinion. Most notably the scene with Hatoko - If you've been up to date with the Anime you know this pretty well. I was taken by absolute surprise, which was.. awesome. were well done and took me by surprise. Aside from a few complaints not really worth mentioning, the show got me hooked pretty fast. If you like super powers, unexpected moments, silly comedy, and (mostly) dynamic characters, I recommend giving it a shot. Superpowers, cuteness overload, humor, and a ridiculous but surprisingly profound MC make this anime great to watch. WARNING: So far, there is no overarching plot. In fact, we're several episodes in and have yet to see a real "supernatural battle." For me, this is a good thing as I don't care for battle anime. If that's what you're expecting, move on. Others have called this slice of life with superpowers. That's probably pretty accurate. However, its funny slice of life. In many ways, this is a parody of both slice of life and battle anime. It sort of teases you, and I like that. Really, come for the powers and humor, stay for the characters. It may be a funny slice of life with superpowers parody anime, but its got some deep thoughts and dark vibes running under the surface, and many of the characters are ridiculous or just too darn cute but have some kind of tragedy to them. Very human characters, in a way. - Some fanservice, but nothing I was uncomfortable with. Just your average beach episodes. Overall, do yourself a favor and watch it. EDIT: So I have finished the last episode of the first season. Supernatural battles do eventually come, however brief they may be, but the harem aspects turn up to the highest setting. Whereas for the first several episodes, the harem element is just there, the last few are in-your-face there with some fanservice thrown in as well. I still enjoyed it, and hope for a new season, but this was a negative for me. Must!!! have a season 2 or at least more episodes!! Such a well done Anime with character development and plot. And the theme is such a good idea. I would love to see more! We, as in Otakus, need to know more!! I hate to see this Anime end so poorly. A 25 episode or maybe 3 seasons wouldn't be so bad. I was actually really surprised with how much I enjoyed this show. I went into watching this expecting just your typical, cookie-cutter harem romcom with magic and, to an extent, it's certainly those things but the fact that it's also got so much character is really what sold it to me. While the whole “super natural battles” bit feels more like a sub-plot at times, the plots are fun and heart-warming; rather slice-of-lifey in the beginning but all with their purpose of introducing various ideas and characters. The characters are fun and enjoyable, especially our main male antagonist who's “chuuni” shenanigans make him hard not to cheer for. The animation and art as well are really beautiful and just really well-polished as a whole. All in all, I wouldn’t say that there’s anything extremely ground-breaking or new about this show but it was certainly an enjoyable binge and it left me wanting more. Here’s hoping for a second season. The girl was mistaken, and to be honest he didn't like her back. These were only two episodes and the characters are still developing, take your time and yes they are bringing into the group, because she has powers, though THAT episode hasn't happened. He only sent the letter because she had powers and felt the need to be dramatic, cool, something along those lines and let her join in. Please...wait for character development. Fans of well-written, slice-of-life type shows absolutely must watch this. The episodes are funny and often touching without being cheesy. Mix that with a pseudo-harem style plot evolution, without the gratuitous fan service, and just the right amount of super-powered action and you get a pretty friggin unique piece of work. Well done, Trigger (as if we expected any less). Your everyday harem, yet incredibly fun. 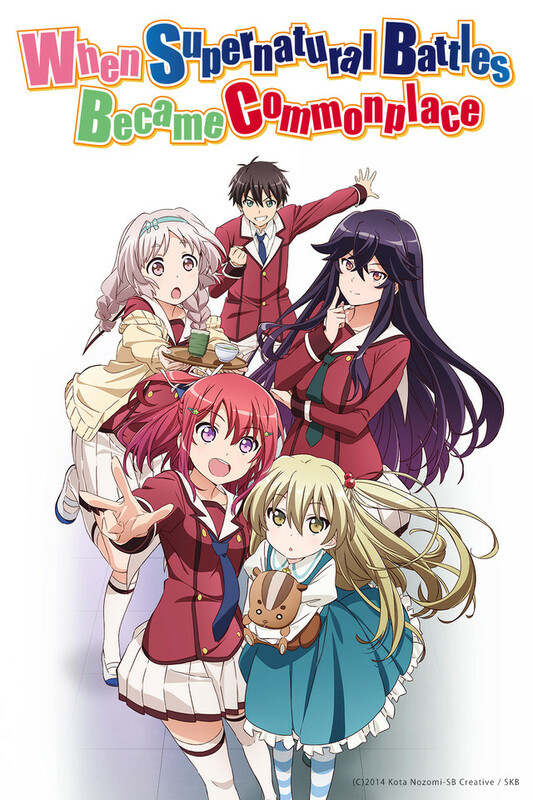 Inou Battle is a very enjoyable action romantic comedy. The characters are enjoyable and not very similar from one another with the exception of it being a harem. The story is simple enough as the characters try to live their lives with these new powers that they have acquired. The ending is kinda open, which would be disappointing if it did not get a second season. From what I've seen, most people have a good or meh impression on the series. I for one absolutely loved it. I hope this series gets a season 2 as there are still many questions that have yet to be answered.